After years of steadily declining smoking rates, Australia is now losing the battle against smoking. 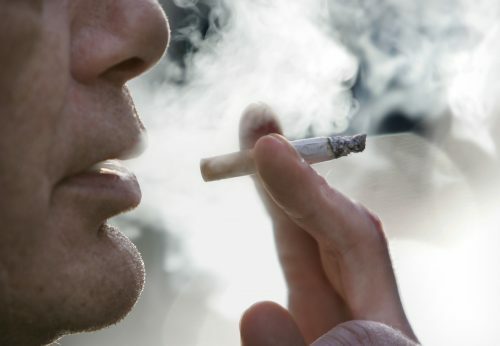 The National Health Survey released today by the Australian Bureau of Statistics has confirmed once again that smoking rates have stalled and the national target levels have not been met. According to the survey of 21,000 people, 15.2% of Australians adults (18 years and older) smoked in 2017-18 compared to 16% in 2014-15 . 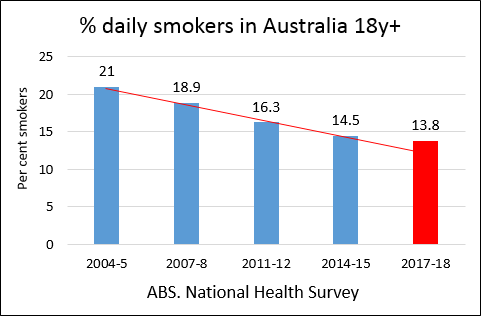 These findings are consistent with other Australian national and state surveys which have shown that smoking rates have stagnated since 2013 and are rising in New South Wales and South Australia. The decline in daily smoking over the last 3 years was one third of the long-term trend since 2004. According to the report,the smoking rates in 2017-18 'have remained similar since 2014-15'. The DAILY smoking rate for adult Australians is now 13.8%, well above the 10% daily adult smoking target set for 2018 by the Council of Australian Governments (COAG) in 2008. Australia has the highest cigarette prices in the world, plain packaging and strict tobacco control laws. However, additional effective strategies are now needed to get things moving again. Smoking is a priority issue as it remains the leading preventable cause of death and illness in Australia, killing 19,000 Australian smokers prematurely every year. The difference between Australia and other high-income countries is Australia’s ban on tobacco harm reduction strategies, ie the use of safer nicotine products like nicotine vaporisers (e-cigarettes) for smokers who are unable to quit. Smoking rates are dropping faster than ever in many of these other countries. There is good evidence that vaping is contributing to this rapid decline. Many smokers are simply unable or unwilling to quit smoking or nicotine with current treatments. We need to make acceptable, less harmful alternatives available to reduce the risks for these smokers. Two out of three continuing smokers will die prematurely from a smoking-related disease, so reducing that risk is a priority. The harm from smoking is disproportionately experienced by disadvantaged populations with high smoking rates such as Indigenous people, people living with mental illness or substance use, low-income people and the homeless. Really time to put the pressure on both sides of parliament with upcoming federal govt. election. For them to leave nicotine and vaping bans as they are is knowing causing hundreds if not thousands of deaths since these stats. show that countries with legal vaping are far more successful than Australia in tobacco control. Stats also indicate that people in disadvantaged groups and mental health issues are more reliant on nicotine and research reveals that nicotine is an effective treatment for some of these problems. The current lack access to nicotine vaping is a serious human rights issue. Big change is also needed with states laws to reverse vaping bans in non smoking areas where vaping would be reasonable and not cause nuciance to others. Example is that vaping should be allowed again in most outdoor areas, just not schools, dining areas etc. The approach of most states treating vaping as smoking is knowingly causing vapers who have quit smoking harm and potential death by exposing to second hand smoke in the limited smoking areas that still exist. Vaping in resonable outdoor areas where smoking is not allowed causes very little or no harm to non smokers/vapers and vapor can be controlled a lot more effectively than smoke. Forcing vapers into smoking areas and applying the very restrictive smoking laws to them is a serious case of discrimination by segregation. This is similar to the shameful history of how countries treated minority groups in the past. This just makes matters worse for people in these minority groups who rely on vaping to give up smoking and/or effectively treat mental health issues. A lot more needs to be done to provide the effective alternative of vaping as simply punishing people for smoking simply isn't working. A very questionable interpretation of the statistics. As the number of regular smokers reduce then the number stopping each year will also likely reduce. Looking at these figures when 21% smoked in 2004 the decline in the following measuring period was 1.1% which is about 5% of the smoking population. In 2014 14.5% smoked declining by 0.7% to 13.8% in the next measuring period. 0.7% of 14.5% is about 5% which is pretty well what you’d expect. Every decline between measuring periods is about 5%. The only anomalous one is 18.9 to 16.3 which is an impressive 2.6% or about 14% but it settled back to to 5% for the next two periods including the latest. The National Health Survey says that the smoking rates in 2017-18 'have remained similar since 2014-15'. On the other hand, smoking rates are continuing to fall in many other countries, in some case rapidly. We clearly have a problem. Here in the US (where several million young smokers have switched to vaping , CDC's 2017 NHIS found 14.0% (34.3M) of US adults smoked cigarettes, including 10.5% (25.7M) who smoked cigarettes daily. For comparison, the 2011 NHIS found 19.0% (43.8M) of adults smoked cigarettes, including 14.8% (34.1M) who smoked daily. Preliminary 2018 NHIS data found 13.8% of US adults smoked cigarettes, and that 13.9% smoked in 2017. Even better news is that largest declines in cigarette smoking have occurred among youth and young adults. Below are data tables. I have been vaping for over 12 months and not felt the need for a cigarette or had a cigarette the entire time. It’s about time our government starts listening to the people who put them there. Vaping should be legal, period. I also don’t believe the 19 thousand deaths a year are attributed just to smokers, people get lung cancer and die, yes that’s true, though many have never smoked at all. Cigarettes get blamed for all lung cancer and it’s simply not true. The air pollution plays a large roll in lung cancer also. Congratulations on making the switch! It is really important to spread the word and tell your story to other smokers whenever possible. The figures for smoking deaths measure the number of cases attributed to smoking. The latest data from Australia indicates that 84% of lung cancer in men and 71% women is attributed to smoking. The cases which not due to smoking are not included in the smoking-related figures. The same principle applies to smoking-related death and disease from other diseases.